Hosting or attending a house concert is the hippest way to enjoy professional, high quality indie musicians playing their own original music. The house concert is a grassroots movement sweeping the country! Here are some house concert FAQ to get you started. By now, you’ve read our articles, Host A House Concert: A How To Guide and How To Hold Your Own House Concert – Part 2. And maybe you’ve just had your first house concert (or planned – or fantasized about it). Wasn’t it fun? Your next one will be even more fun, because you’ve already got your large potential guest list, and you have the experience of a successful event. 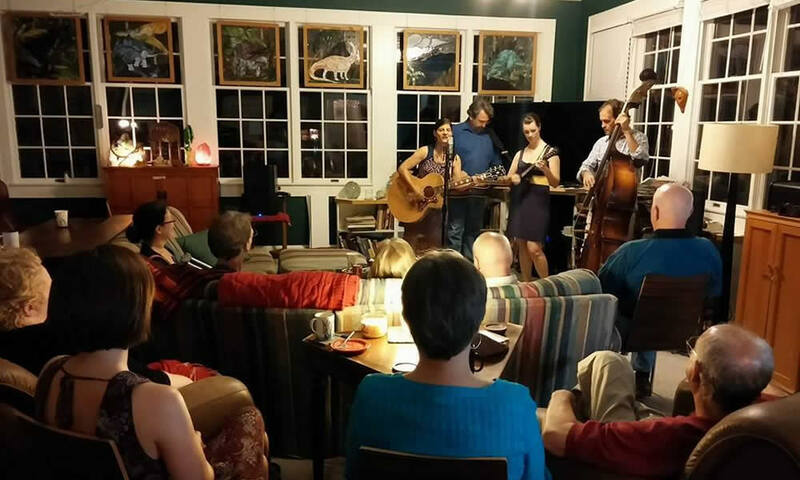 House Concert FAQ: How do I build an audience for my house concert series? 1. Book great artists for every show! Your guests will fall in love with house concerts and look forward to your next one based on the performing artist’s personality and rapport with them. Not every talented artist likes to do house concerts. Be sure and get performers who enjoy being “up close and personal” with their audience. They will be the best at connecting well with your guests. If possible, see the artist live before booking them. If not, watch their videos on YouTube, Facebook, or their website. 2. Book artists with a fan base in your area. It doesn’t need to be a large fan base, but even a handful of extra guests could make the difference in your concert being attended well enough to be worthwhile. Sometimes you can find a regional or national artist who tours regularly in your area. Or maybe they love your town, but can’t get enough work in the area to make the trip financially feasible. You’ll find some people who recommend bringing in an opening act just to bring in more guests. We don’t recommend this, because 1) they stretch out the event, making it too long, and 2) they detract from the CD and merchandise sales for the main act. Keep reading about House Concert FAQ to learn more. 3. Keep building your email list. Create a signup form for your own email list and make sure everyone sees it at every show. Continuing to build your email list is a key factor in building an audience. Promote your house concert series by talking about it in public. Wear a shirt, hat, pin, or sticker in public to encourage people to ask questions. Grow your circle of friends and acquaintances by joining social clubs. Think about a pet club, garden club, book club. Create a new group on Meetup.com. There’s a minimal monthly charge, but it’s a great way to connect house concerts with your other interests. People have started very successful house concert series by starting clubs for their other interests. Why not your “Devoted to Daschunds” group, too? 4. Make sure your guests love every event. Once you’ve secured the best act you can get, and made your guests as comfortable as you can make them, make sure that YOU are having a noticeably good time. Your smile will be contagious, helping everyone to have a great time. You probably have a core group of friends who would be willing to help out. Take away some of your stress by asking them to do a few easy things like collecting donations, helping out with merchandise sales, keeping an eye on the bathrooms, or making sure everyone sees your email list. House concert FAQ: Do I need to buy a sound system for my house concert series? It’s possible that you don’t need a sound system, at least to start. If you have a small room with good acoustics (hardwood floors and a high ceiling), and your audience is small (less than 30 people), you may not need a sound system. Even so, many artists like to have a little sound reinforcement when performing. Otherwise, start out with artists who have their own sound system. If you want to book a certain artist who doesn’t have their own, you may contact someone locally who has a sound system they will let you use for the show. Once you’ve had a few house concerts, you can make the decision about whether or not to purchase your own sound system. Expect to spend at least several hundred dollars, and possibly up to $2,000, depending on your needs and taste. Do I have to pay any performing rights organizations? You may have heard of performing rights organizations such as ASCAP, BMI, and SESAC. These organizations are responsible for collecting money for the public performances of music, and then distribute the monies to songwriters and publishers that own the rights to the songs that are performed. House concerts are PRIVATE, take place in a home and are invitation only. Many artists will be performing their own original music. You, as the host, are receiving no money for the performance. But even though house concerts are private, not public, concerts, and many of your artists will be presenting original music, it is possible that you may be approached and asked to pay a licensing fee. To avoid this, it’s best not to put your phone number or address on flyers you post publicly. For people you don’t know who are interested in coming to your house concerts, require them to email you for an invitation and details. There are more reasons than this that you don’t want unexpected strangers showing up at your door the day of the show. If you’re still concerned about performing rights organizations contacting you, you may consider joining Folk Alliance International at folk dot org. They’re an organization that promotes music around the world. They have an agreement with ASCAP and BMI (not SESAC) that would help if you’re ever approached for licensing fees. House concert FAQ: Am I supposed to have handicap access? Your house concert is a private party, and because of that, you have no legal obligation to provide handicap access. However, when you’re inviting people to your home, it’s wise to think about any challenges your property may have for physically challenged or elderly guests. Consider such things as a steep driveway, or lots of stairs coming up to your home. House concert FAQ: What if the neighbors complain that I’m running a business in my home? Again, house concerts are private, invitation only, parties. But it takes only one angry neighbor to turn your fun events into a hassle. They may even accuse you of bizarre and untrue things. No matter how crazy their claim, it may be more trouble than it’s worth to deal with city officials who want to deny your right of free assembly to humor the complaining neighbor. In this case, keep your neighbors happy and co-host with another homeowner for your house concert series. House concert FAQ: Should I have special insurance? House concert FAQ: Am I supposed to advertise my house concert? We recommend that you keep your events private. This keeps unexpected people from wandering into your house concert. However, there are a number of house concert hosts who are very public about what they do, posting flyers and connecting with local radio and charities to create more awareness. Before you do this, though, consider your community and whether you feel safe being public about it. These House Concert FAQ answers should help you to get your house concert series going! Do you still have questions? Comments? We would love to hear them in the comments below! And thanks for reading House Concert FAQ.